Back in my undergraduate career, I took a fascinating class on Religious Studies. Coming from a small-ish town in Minnesota, I had a yearning to hear about the world and how people lived; my upbringing was about as homogeneous as it gets (unless you count the occasional interdenominational Christian marriage as “diversity”), so I wanted to soak it all in; I ended up majoring in Global Studies and Spanish, after all. After I had knocked out my homework for my required classes, it was almost something of a treat to dive into the study of spirituality and find common threads and distinguishing characteristics of various religious experiences around the world. Surprising (or possibly, unsurprisingly, if you’re familiar with the academic world), this class came with a dense vocabulary book; terms invented or repurposed to define the through lines between different expressions of spirituality. Until today, one term in particular has stuck in a way that others haven’t: Hierophany. A hierophany, simply put, is a bursting through of the divine or the spiritual into humanity. It is a melding of the “sacred” with the “profane,” or at least an interaction between the two. Some traditions are rife with them; it is not at all uncommon for some peoples’ gods to manifest in regular, frequent ways. Now in Advent, I’m drawn to reflect on this theme within my own beliefs: What constitutes a hierophany in Catholicism? Where does God burst through into our very human existence? How does Jesus Christ meet us? In some ways, I would almost argue that the term doesn’t even apply; if you believe that God is ever-present, is he really ever breaking through any kind of divide between the “sacred” and “profane”? If the God-Man came to Earth as a human infant, can anything human truly be called profane? But let’s flip the script. Can anything be more accurately described as a bursting through of the divine than the incarnation? What about the Eucharist? While it’s true that God is always with us, that His Spirit dwells within us, we also profess a unique faith in the Sacraments. The Sacraments reflect God’s understanding of the very human desire for a tangible, material experience of the divine. Sisters and brothers, GOD CARES FOR US. Even the imperfect parts of us that cannot believe without seeing! He gives us real matter, things that we perceive with our five senses. St. Thomas Aquinas is famous for his view that our physical perception of the world around us was an essential to experience and learn more about God. If this is true, how good it is that God gave us His Son, who became man! How wonderful it is that Jesus gave us the Sacraments! Last week, I discussed the “Three Advents”: The birth of Jesus Christ, his Second Coming, and Christ coming into our lives every day. The first two move us greatly. What inspires greater celebration than Christmas? And what inspires greater fear and awe than the Second Coming? But how deeply are we affect by the Third Advent, where Jesus Christ bursts forth into our lives every day. He is present in Spirit, in Scripture, and in the Sacraments. Let us rest in His Spirit, soak in the Scripture, and avail ourselves of the Sacraments. As we reflect on his birth during the Advent season, may we also reflect on the ways he visits us every day. Last weekend I had the great pleasure of participating in a silent retreat with my grandpa, dad, and two uncles. It’s been a Breen family tradition for some years now to visit Christ the King retreat center in The Other Buffalo (Buffalo, MN). This was a particularly challenging retreat, for whatever reason, but it was also particularly inspirational: I felt empowered to enter Advent with a fresh set of eyes and grace. I’d like to share one of the core takeaways I experienced. For me, St. Bernard’s Three Advents had a personal parallel. Every year, it seems Advent flies by. There’s the Advent that others may experience: no thought of the “reason for the season” whatsoever; pure commercialism and chores and cooking, and, “Sheesh, I could use a vacation from my holidays.” Then there’s the “ideal Catholic Advent”, spent immersed in prayer and quiet contemplation, racking up devotions and novenas like someone’s keeping score (jk, love you all who do it well!). And finally, there’s the Advent that most of us experience: somewhere in the middle. At the retreat this year, God spoke into this part of my life. He told me he didn’t want me to feel guilty for not having the ideal, but to strive for something greater than the mindless. Most profoundly, God asked me to reflect on how Mary, Joseph, and Jesus experienced the first Advent. Did they spend hours in quiet contemplation in the temple? That’s not the version I’ve heard. I was inspired to think of the Holy Family, making a home wherever they could, and ultimately celebrating Emmanuel’s arrival in a stable/cave. They were living a real life, just like we do. They were a real family, just like mine. God does not call us to rise above our family life to some sort of mystical state of prayer during Advent, he came for just the opposite: to redeem the human experience and to sanctify family life! My guilt for not setting aside more time in prayer melted away. Don’t get me wrong. Prayer is essential. Meditation and contemplation are wonderful. A mystical state of prayer is Catholic #goals. But many of us also live lives with very real demands THAT COME FROM OUR VOCATION. I am busy because God has called me to be a husband and a father. Since he has called me, HE WILL MEET ME THERE. When God calls us to our vocation, he is also promising to meet us there! For those who do not live the monastic life, our role models do not need to be the monks! Instead, I felt the Lord calling me to reflect on how the Holy Family lived the first Advent: Christ’s quiet coming in the night. I felt the Lord calling me to drop the shame and instead seek for the moments where I could ponder Jesus in my heart. Mary and Joseph are my examples this season, and I feel free. Praised be Jesus Christ, true God and true Man. Today’s readings contain what is quite possibly the most well-known Psalm in all of Scripture. Psalm 23 has been used in all sorts of media: presidential speeches, blockbuster movies, hip hop and metal songs alike. Psalm 23 provides an easily recognizable religious reference, a comforting message, a clear, straightforward refrain. The desire for contentment, provision, and protection are ubiquitous, and align pretty well with our basic human needs¹. In praying with the Psalm today, however, I felt that the Lord was calling us beyond the easy reading. We are not guaranteed access to the LORD’s protection and provision. Our calling does NOT boil down to the platitude, “We just need to see where God already is in our lives and be content with our current life circumstances.” I learned not be jealous and/or greedy in kindergarten; I believe the Holy Spirit has more for us here. Results: I shall want nothing. I will rest beside still waters and verdant pastures, His rod and staff give us courage. Prerequisites (aka what WE need to do): The LORD must be our shepherd. We must be guided. We must be anointed. Take a look at that second part! So often we focus on the results, without asking what we need to do! Part of the reason I believe this passage has gained so much traction in popular culture is the hope for deliverance. It’s not wrong to ask to be spared or delivered, but will it have any effect if we don’t meet the conditions or put ourselves in the position to receive it? Miracles are wonderful gifts from God but are only truly useful if our hearts are primed for relationship with Jesus (see: Nazareth, Mark 6). So how do we prime our hearts for the LORD? How do we make ourselves ready? How do we get the God of the Universe to be our shepherd, give us all that we need, and protect us? Are we willing to follow the LORD? Do we ask where we should go? Do we trust that his paths lead to verdant pastures, or do we stick to our own, temporarily comforting paths and habits? Where in your life can you ask Jesus to lead you? Where are you currently trying so hard to find your way, and have yet to really pose the question to Him? Jesus’ promise is real, it is beautiful, and it is comforting. He DOES lead me to verdant pastures. He DOES give me rest. He DOES protect me from my enemies and from fear. We WILL dwell with the LORD. 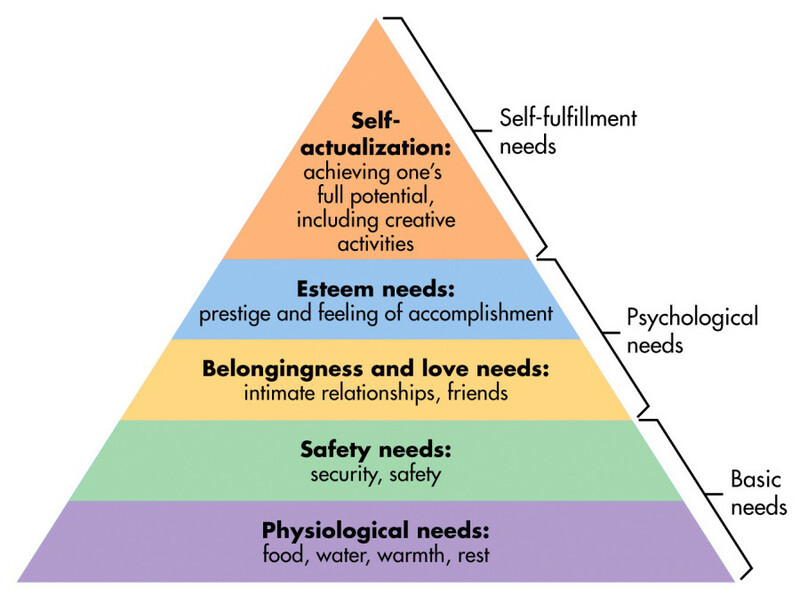 Yes, yes, Maslow’s hierarchy is outdated and problematic in many of its forms. Just making a point here.